WAC DL-150-BK Line Voltage Clamp Mount Display Lights combine precise angling features and a heavy-duty universal clamp attachment. Do not underestimate the importance of lighting in planning your display for an art show, craft show, trade show or merchandising display. Display lights are ideal for lighting temporary exhibits, booths and craft displays. “How should art be presented to enable it to be appreciated by viewers? There is no uniquely correct answer, and clearly this question involves more than just lighting… lighting does not merely make things visible… it affects their appearance, and for artworks, this implies that it will affect viewers’ appreciation of the artworks. Your lighting is meant to display your products at their best. It is more like merchandising lighting. 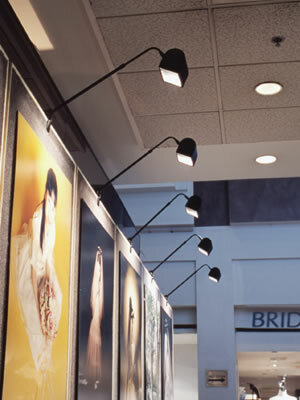 “Proper lighting is vital to selling, both inside and outside the store. Light directs customers’ eyes to the merchandise and invites them to buy. Lighting is very effective In making your booth, your works stand out. Lighting is a fundamental part of planning and designing an effective display. 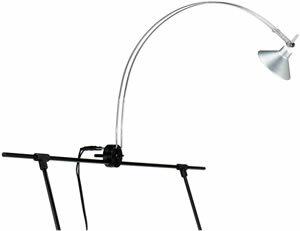 Wac Lighting Clamp Mount Display Light is available in black or white. It easily attaches to a frame or display. 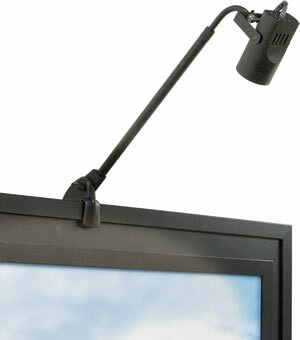 The optional Framing Projector accessory easily attaches allowing the display of a four-sided image. This allows a square or rectangular area of light to be formed on artwork with minimal light spill, giving paintings and drawings a “self illuminating” effect. Tech Lighting has lightweight and versatile clamp on fixtures with a universal clamp that provides a secure grip on any surface shape, from a 1/2″ pipe to 4″ wall. Complete with 12 volt plug-in transformer with in-line switch and 10’ cord. They are available for 50 or 75 watts. 12 volt, MR16 lamps. 17.5″ long, with a 10″ high swooping curve. The head pivots to direct beam. It uses a 12 volt, MR16 lamp of up to 75 watts. The round clamp grips securely to a panel as slim as 1/4″ or as thick as 1″. The banner channel allows a tight hold to 5/16″ banner frames. 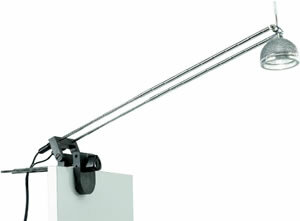 The length of the fixture may be adjusted by sliding the arms back and forth through the clamp. It has a 12 volt, 75 watt plug-in transformer on a 10′ cord to plug into a standard outlet. This entry was posted on March 4, 2013, in Lighting. Bookmark the permalink.